The red rice yeast is derived from a fungus called Monascus purpureus. Originally used in China as a food coloring or ingredient, red rice yeast is now recognized as a food supplement with many virtues! It is 800 years before our era that the Chinese discover and consume red yeast rice in their gastronomy and traditional medicine. It is used in gastronomy as a dye or spice to enhance the taste of food but also serves as a preservative and ingredient in the manufacture of rice alcohol. Traditional Chinese medicine uses red rice yeast to promote good blood circulation, relieve indigestion and diarrhea patients. It was in the 1990s that red yeast rose from Chinese territory east and introduced in North America. Now known as a dietary supplement, red rice yeast is quickly gaining public favor thanks to its effectiveness on certain diseases. 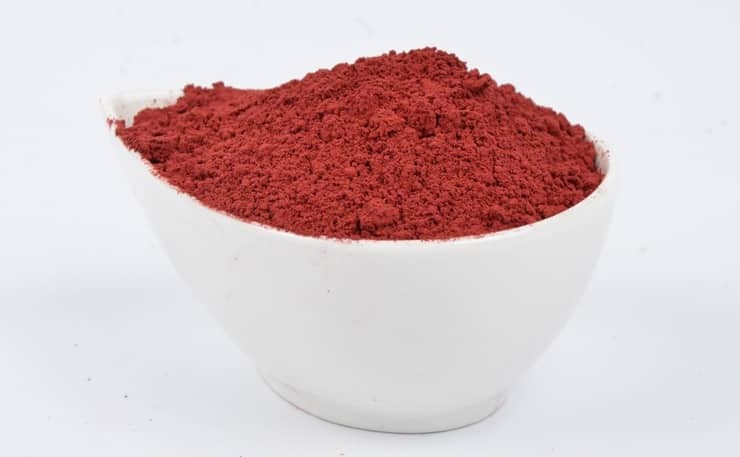 The china red yeast rice powder is the result of the fermentation of a red microscopic mushroom, better known as “Monascus purpureus,” grown on white rice. After fermentation, the rice is air-dried, pulverized and encapsulated in the form of tablets or capsules. The red rice yeast contains monacolines, that is to say, substances that inhibit HMG-CoA reductase, including natural lovastatin, which is more commonly known as monacolin K.
Increasing blood cholesterol is a metabolic disorder that needs to be taken very seriously. It can cause very important disorders such as Strokes (Cerebrovascular Stroke) or heart attacks. It is characterized mainly by deposits of cholesterol in the blood system. The red yeast rice has a high content of monacolin K. The structure of this molecule is very close to some drugs that fight against cholesterol, such as lovastatin for example. Monacolin K is part of the statin family. They play an important role in inhibiting the synthesis of cholesterol by the liver. Monacolin K, therefore, has the effect of lowering cholesterol and triglyceride levels in the blood. Under the action of this molecule, the liver will decrease its secretion of cholesterol. To continue to work, it must, therefore, draw on the bad cholesterol present in the body which will induce a decrease in the latter. The yeast of red rice contains, in smaller quantities, other substances for fighting too high cholesterol levels such as isoflavones, phytosterols or monounsaturated fatty acids. The effect of red yeast rice on cholesterol levels will be seen after a few weeks of treatment (usually after four weeks). Only a blood test will show a decrease in blood cholesterol levels. As with all food supplements, the yeast of red rice is subject to some precautions for use. If in doubt about the dosage or any side effects, it is recommended to call a health professional. It is advisable always to observe the daily doses of china red yeast rice powder recommended by the manufacturer. Depending on the brand, the dosage will be 1 to 4 capsules, 1 to 2 times a day. Even if taking red rice yeast capsules is well tolerated on a daily basis, it is advisable to take them during a meal. Avoid drinking grapefruit juice within 2 hours before or after taking red yeast rice. To increase the therapeutic effect of red yeast rice, it is recommended to have a healthy lifestyle, a balanced diet and to practice regular physical activity. How to choose your food supplement of yeast red rice? Several packages are available on the market. Red rice yeast is usually in the form of capsules or tablets. Choose the presentation that suits you best. The concentration of monacolin K is also important to take into account. For an optimal therapeutic effect, it is advisable to take between 10 and 12 mg of monacolin K per day, i.e., 1000 to 1200 mg of red rice yeast with 1% of monacoline K.
Choose the organic red rice yeast that will offer you a good quality food supplement. Check that the proposed product is certified without citrinin (a toxin that can cause kidney problems). Several clinical trials highlight the benefits of red yeast rice. Thanks to its high content of monacolin K, red rice yeast is a natural dietary supplement that effectively combats the rise in cholesterol levels in the blood.